Companies in the food processing industry are increasingly working to produce sustainably and effectively. Waste reduction plays an important role in this. This development is supported by the government in the form of research projects and subsidy schemes. More importantly than this indirect influence, is the voice of the consumer who wants to buy sustainably produced food, preferably produced in companies participating in the circular economy. There is also a strong economic incentive to reduce waste: case studies show that reductions of 25% to 50% can be achieved through targeted improvements in production processes. This blog post describes several scenarios about waste in a food processing company, and shows how a software solution with sensors, IoT and smart data processing can facilitate waste reduce. Mark’s Bakery Ltd (a fictitious company) is a producer of sweet bread rolls, which are filled with cream, fruit jelly and chocolate fillings. Mark’s Bakery Ltd receives the raw materials flour, milk, fruit and cocoa, which are stored in large tanks. The production process consists of three phases, which have been unlinked by means of storage. The production of the unfilled rolls, in the steps of mixing, kneading, rising, kneading, forming and baking. Input for this phase are the raw materials, and output of this phase are the baked, unfilled rolls. These rolls are stored in a refrigerated warehouse and have a limited shelf life. Filling the rolls with cream, fruit or chocolate. The steps are: making the filling and filling the rolls. The filled rolls are stored in a refrigerated warehouse and have a limited shelf life. The packaging of the filled rolls based on customer orders, in boxes of different sizes. Here are the steps: packing the filled rolls into boxes, stacking the boxes in large boxes, palletizing and preparing for transport. Customer orders must be delivered within 24 hours and sent via refrigerated transport. The production process of Mark’s Bakery Ltd involves waste and spoilage. The waste problem occurs in several situations. The raw materials milk and fruit must be processed within a relatively short time in the filling process, otherwise it is unsuitable as filling. If the milk or fruit can no longer be used, it is processed as waste. The milk goes to a feed mill, but the fruit is dumped. It is therefore important that these raw materials are processed in a first-in / first-out method, and that the shelf life is checked. At present, the shelf life check is based on logistical information (purchase order), not on current product characteristics. The unfilled rolls and filled rolls have a limited shelf life. If the rolls can no longer be used, they are dumped in a waste container that is periodically emptied. Depending on the quality of the waste, it can serve as raw material for animal feed or it is destroyed. At this moment the amount of waste is checked manually and there is no question of quality checks. Sometimes during the production accidents occur with the products, such as the dropping of boxes. Then the rolls are also rejected as waste. Rolls are rejected during quality inspections and become waste. In the roll filling process, the filling machine has insufficient production capacity. Then there are temporary stocks of filling and unfilled rolls on the factory floor, which, due to temperature, leads to the spoilage of the filling and rolls. These stocks are rejected by the quality inspector. In several steps in the bread roll production process and the filling process, operator errors and machine failure result in spoilt products. In the mixing of the raw materials for the dough and the preparation of the filling, there is a regular imbalance. Then raw material 1 is present, but raw material 2 is missing. The buffer for raw material 1 flows over. The baked rolls must be packed in boxes. These boxes are not always available on time, but the ovens continue to bake. These rolls are then dumped in a separate bin. Gain insight into the details of waste and spoilage by measuring and monitoring the current production processes. For this, sensor data from the machines, but also manually registered measurements are used. Identify a) the main bottlenecks and b) the bottlenecks that can be solved the fastest. Analysis of the causes of the bottlenecks. It is important to consider the attitude of the employees. Defining concrete improvement steps. For Mark’s Bakery Ltd it is important to achieve quick wins so that the entire team is enthusiastic about the changes. See if the improvement steps lead to results and adjust if necessary. Martin, an innius business consultant, gives a presentation and a demonstration to the production team at Mark’s Bakery Ltd, in which he shows how innius helps to reduce waste and spoilage. The following diagram shows the application of innius. New or existing sensors on the various production machines measure the levels of incoming raw materials, products produced and wasted material. Sensors are placed on simple production support aids, such as bins and containers, to determine the levels and temperature of the content. Other sensors measure the availability of machines and tools. The measurements from the sensors are recorded in innius. The manual registration of waste and spoilage is replaced by a simple application that allows production employees to record waste, spoilage, machine standstill, machine defects and quality measurements in innius. The data measurements are aggregated in innius and processed into performance indicators, which provide insight into the availability of machines and resources, into the flows of raw materials and products, and in the generation of waste and spoilage in the process. The data measurements are immediately visible to employees and production managers, both on dashboards and apps. Various threshold values ​​with corresponding notifications are calibrated so that employees receive immediate signals when problems occur and can intervene operationally. Employees are given direct tasks to carry out operations in production, such as replacing waste bins. 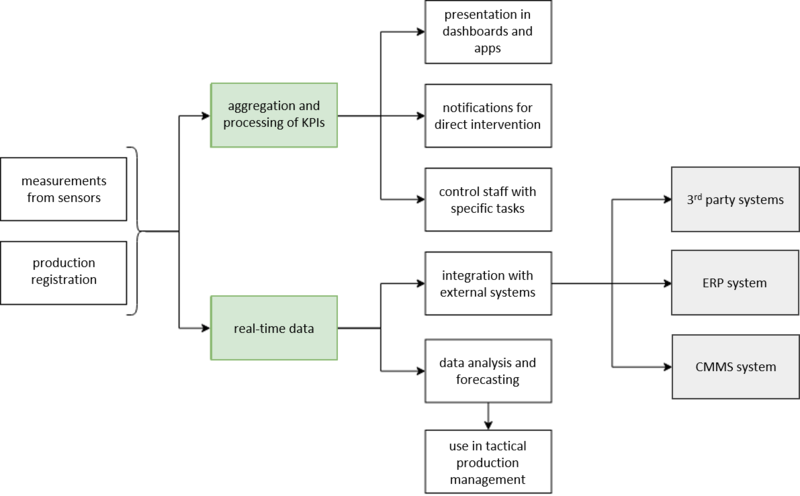 Production management uses the data analysis and forecasting possibilities of innius to make tactical decisions for production planning, maintenance and purchase of raw materials. innius sends real-time production data to external systems for better integration between production and logistics, possibly also maintenance. Measurements of level sensors on the waste containers, which indicate when the containers are full, what the temperature in the container is and how long the container is already in use. On this basis, the retrieval of the container and the placement of a new container can be automatically planned. Measurements of temperature sensors on the tanks of milk and fruit, and measurements of temperature and shelf life of bread rolls in the cold stores. Based on this, the processing of raw materials and semi-finished products is optimized and the purchasing and sales departments are informed. The capacity of the filling machine is continuously monitored. The supply of rolls from the warehouse and production of the filling is adjusted to meet this capacity. The levels of the raw material tanks are measured and matched. The supply of crates for packaged rolls is steered by the box level measurements. Mark’s Bakery Ltd produces 200,000,000 filled rolls per year, with 250 employees and 80 machines. The production costs per roll are € 0.06 and the material costs per roll are € 0.05. The total production costs per year are € 22,000,000. The percentage of waste and spoilage in production is 7%. The percentage of savings / improvement by means of an IoT solution is between 25% and 50% (according to the literature). An improvement of 25% is assumed in this case. So, the saving is € 770,000 or 4% of the total production costs. The business case shows that € 770,000 can be saved by using a smart IoT software solution.